New Delhi: Shiva Gopal Mishra has submitted fifteen important items for inclusion in the agenda for the National Anomaly Committee meeting based on 7th CPC Anomaly on August 16, 2017 to Dy. Secretary - JCA, Department of Personnel & Training. When a Government Servant promoted/appointed to a higher post which involves assumption of duties and responsibilities of greater importance than those attached to such permanent post, he will draw as initial pay the stage of the time scale next above his substantive pay in respect of the old past”. The above stated stipulation imposes reduced/ or no financial benefit to an employee on promotion. In many cases the benefit has now become equivalent to one annual increment. The clause in the existing FR subject to a minimum has also been omitted in the revised pay rules. In the existing pay matrix, the stages are same in most of the levels such Level 2 & 3, 6 & 7, 7 & 8, 6 & 8 etc. ln this situation, if an employee is promoted/upgraded under MACPS from one level to another level, his pay will be almost same as he may draw even without promotion. 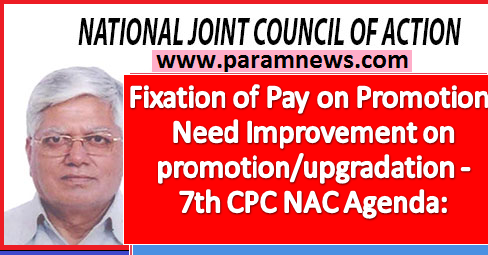 Necessary amendment in the Rule-13 that - ”on promotion/upgradation of an employee, if the stage/cell on pay fixation is equal in the promoted/upgraded level, he shall be placed at the next higher cell/stage in the promoted scale (Level)" - may be made.